A leading Fragrance Marketing Solutions Company in UAE is looking out to recruit well experienced Senior & Junior Sales Executives for Dubai and Abu Dhabi Branches. Ideally, you will be proactive and a go-getter; take up challenges of closing new deals, goal oriented with an objective to achieve targets; build and manage client relationships and contribute towards growing the business across UAE. You will have relevant educational attainments of any discipline; under 35 years; with 3 years of UAE experience in Outdoor Sales, with a valid UAE driving license, which is a must. You will need to pitch within the Corporates which requires good working relations within Government Institutions, Financial and Banking establishments and other multi-national companies, with an excellent personality, communication and presentation skills; flexible with timings as your job role would require to meet and greet potential customers at times as the trade requires. 2: Europeans, Pakistani, Indians, Arabs, Filipinos and Sri Lankan Nationals are proffered. 3: Both Male and Female Gender required. 4: UAE Driving License is must. 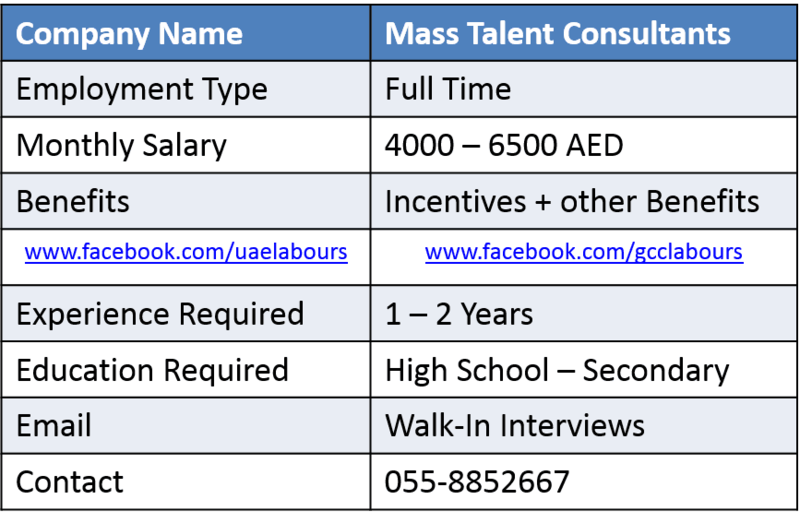 Benefits: Incentives and other Benefits as per UAE LABOUR LAW. Metro : DIFC Metro Station – Sheik Zayed Road. Interview Timing: Today, Saturday, 29th October 2016 from 10:00 am to 03:00 pm. Note: Please Walk in with a CV and a passport size photograph ONLY if you have the above requirements. Shortlisted candidates will be interviewed by the client the following day. For immediate placements.